Photos by Tom Rivers: Tom Barry urges the Lyndonville Board of Education to let the school have its own varsity boys soccer team, beginning next school year. Barry said Lyndonville and Medina both have plenty of boys for their own teams. LYNDONVILLE – Lyndonville varsity boys soccer players will continue to play on a merged team with Medina for at least the next four years, the Lyndonville Board of Education decided on Monday during a contentious board meeting. Many Lyndonville parents have urged the district to bring back its own boys soccer team. Lyndonville has played with Medina the past six years with Medina hosting the team. Both districts have an upcoming varsity cohort with nearly 20 players from each school. There are 11 players on the field at once and each team should have some substitutes. Some Lyndonville parents said a combined team will mean many good players will be cut and won’t play, or will be on the bench when they could be playing for their own school. 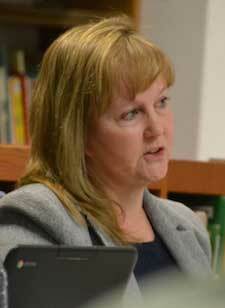 Susan Hrovat said the merged programs boost opportunities for Lyndonville students. The board admitted it has been a difficult decision. 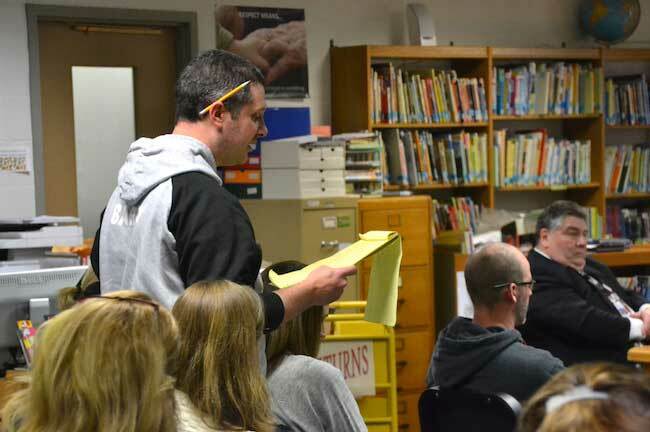 Richard Mufford, Lyndonville’s board vice president, disputed that, saying the eight shared programs are intended to be looked at individually. Medina wouldn’t drop Lyndonville from the other agreements because Medina would otherwise struggle to field their own teams and their programs would be diminished. “They’re in as much need of us as we are of them,” Mufford said. He said the intermunicipal agreements were supposed to be temporary and evaluated on a frequent basis, looking at student numbers and other issues. Lyndonville and Medina have eight shared programs with Lyndonville hosting the boys volleyball, girls varsity soccer and the musical program. Medina hosts a merged boys varsity soccer, varsity football, cross country, the marching band and swimming. Medina school officials wanted stability and a long-term commitment from Lyndonville. Normally the agreements between the districts are for one or two years for each program. This time the agreements will be for four years. Ted Lewis, the Lyndonville BOE president, said the merged programs have given Lyndonville students new opportunities with football, swimming, cross country and the marching band, which aren’t offered at Lyndonville. The merged teams also ensure other programs will continue. “That speaks to adding and maximizing opportunities,” he said. Lyndonville in recent years has typically only had five to 8 players on the boys soccer team. This past season it had 12. Lewis said the district has a declining student enrollment. 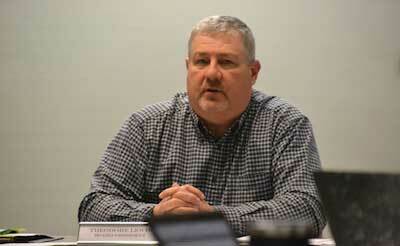 Ted Lewis, the BOE president, wants stability in the merged programs. The merged team passed with a 5-2 vote. Mufford and Terry Stinson both voted against the merged boys soccer, but backed the other seven intermunicipal agreements. Mufford is a Medina graduate. He said both schools are great communities. He wants to see more support for the merged teams. Right now, only the family members of the players tend to go to games. That differs from Lyndonville basketball games and other sports where Lyndonville has its own team. Those games are big community events, he said. Mufford would also like to see more games played in Lyndonville with the merged team. Medina is in Section 6 and Lyndonville is in Section 5. The Section 6 referees by contract can’t work on a field in Section 5 for league games, Lyndonville school officials said. That has limited Lyndonville to hosting a few non-league games and exhibitions. Stinson also said the community needs to embrace the merged teams as a Lyndonville team, and show support for the athletes from both schools. Katie Whipple has a son on the team. She said the Lyndonville and Medina kids each play on their own modified and JV teams, and then some players are left out with the merged varsity team. She said Lyndonville should be focused on trying to have as many kids opportunities to play as possible. Some who have played since seventh grade will see their soccer careers end by the time they are juniors and seniors, she said. When the board was voting, Whipple’s husband Patrick interjected and told the board it wasn’t following its policies for decision-making. “You are being negligent in your duty,” Whipple yelled. He was told to “stand down” and leave the room by board members. Whipple obliged and left the meeting after back-and-forth shouting. Board member Kelly Cousins acknowledged the issue has stirred passion from parents. She said that participation from the community is an asset for the school district, she said. Cousins said she spoke with a Medina board member who told her Medina didn’t want Lyndonville to leave the merged boys soccer. Cousins said Medina isn’t dictating the decision-making at Lyndonville. However, Medina would see Lyndonville’s departure from a merged boys soccer as hurting the relationship between the two districts, Cousins said the Medina board member told her. “I’m not willing to take that risk,” Cousins said about straining the partnership between the two districts. Board member Sue Hrovat of Lyndonville said she had a similar conversation with a Medina board member, who told Hrovat Lyndonville’s exit from that agreement would be viewed unfavorably with the other shared agreements. Hrovat supports staying with Medina, for all of the programs. “I know that this is the best thing for our school long-term,” she said.